You beat me to it, SSG. Nice way to avoid the overall trend. "Nice way to avoid the overall trend." Obviously one year's worth of data makes not a telling trend. Though what next year's poll says will be a better indication. However I believe there are several other indicator which show that the death of gun ownership isn't going down. For example, there is a growth of indoor shooting ranges in my state. One opening but a half hour from me. And it was made from an old bowling alley. There is also growth in school shooting leagues in my state. Trap shooting in particular, an Olympic sport by the way. "Trap shooting teams like this one, part of the Minnesota State High School Clay Target League, are reawakening aging gun clubs across the state. To make room for Minnesota’s fastest-growing high school sport, clubs are expanding hours, building fields and installing new target throwers. Still, with 6,100 students competing, many clubs are maxed out. Waiting lists are growing. This year, teams turned away 1,800 kids because of limited shooting range time, said Jim Sable, the league’s founder and executive director." At 42 that's the lowest since 1984, 30 years. Umm...no. 38, 34, 38, 39, and 37 are all lower than 42. The overall trend is there for all to see. 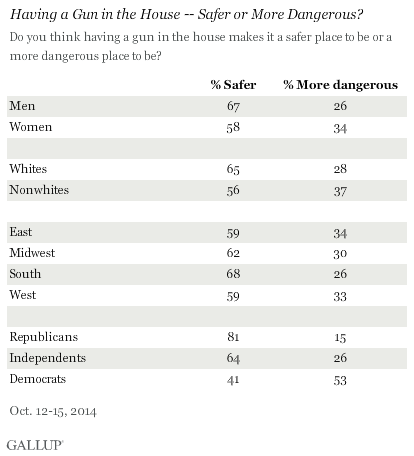 So is the overall trend of a rising percentage of people realizing that a defended home is safer than an undefended one. Mike, it's a poll. You should take it with a grain of salt. These numbers don't jive with reality either. It is showing a net loss of 9.4 million households ditching guns at a period of unprecedented gun buying and gun manufacturing (2012-2013). Yeah sure, you'll just say that was gun nuts buying up while "reasonable" people were getting rid of their guns. So in addition to the crazy market we saw, you are saying the private market also flooded the supply with 10-20 million used guns. But then the following year, during a period of sales returning to normal, 6 million households changed their minds and bought guns again. It's just not consistent with what we know about gun sales. Some polls are just not going to give you good answers. Asking about guns is one of those questions that some people see as personal. If you ask the question "have you ever had an abortion?" You're also not likely to get accurate results. Same with "have you ever used a gun in self-defense?" which I'll note you're happy to deduce that 99% of the answers must be lies. "Same with "have you ever used a gun in self-defense?" which I'll note you're happy to deduce that 99% of the answers must be lies." First of all, I don't think they as if you've EVER used a gun in self-defense. It's usually within the last year, isn't it? Secondly, I don't say "they must be lies," as much as I question the definition of self-defense and what properly can be considered that. First of all, I don't think they as if you've EVER used a gun in self-defense. If I may be forgiven a bit of plagiarism: "Is that a sentence? You're really getting sloppy lately, [Mikeb]." Actually, I've always been sloppy. You're the one who tries so hard to avoid mistakes and you're the one who often points out the minor mistakes of others as a way of feeling superior yourself. You're the one who tries so hard to avoid mistakes . . .
Is that somehow a bad thing? Is "always be[ing] sloppy" a good thing? Should I aspire to write more like you, with blissful disregard for such trivial concerns as grammar, factual accuracy, and logic? There go the gun loons again denying a poll by the most respected pollster in the country, but they will offer up numbers by some pollster never heard of to make their sides points. Laughable. "There go the gun loons again denying a poll by the most respected pollster in the country"
Why would gun rights advocates deny a poll by the most respected pollster in the country, (your words) that supports our belief that the rate of gun ownership isn't decreasing? I said that one data point doesn't equal a trend and next years poll will give a better picture. Lets keep in mind also that this is one of those most respected pollsters who made the claim that 80 to 90 percent of voters supported universal background checks. And when it came to a true vote, was in fact much lower than claimed. 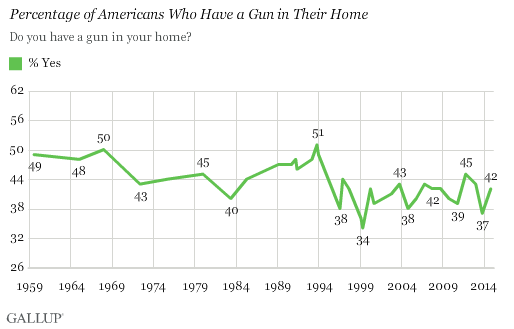 ss, the percentage of Americans who have a gun in their home has gone down. Do you not see that? About the disparity between the polls that showed 80 to 90 percent support for background checks and the actual vote, isn't it possible that the polls included some people who were not eligible to vote or who elected not to do so? In other words, as TS always points out when I present a poll he doesn't like, polls must be taken with a grain of salt. I'd go further and say they cannot be compared to a vote. Apples and oranges. SS, you also believe a minority vote represents the whole countries stance on an issue, which of course is hogwash. I'm not even talking about any specific issue, but your continued expression that the polls Mike uses are flawed, but the polls you use are not. Typical for a deceptive person.